We eat hard boiled eggs all the time in my house! I often reach for one as a mid-morning snack, and they make a speedy appetizer when deviled, too. Once I started hard boiling eggs in the Instant Pot, I never looked back. I know, cooking eggs on the stove top isn’t a difficult task, but it really is a lot less fussy to make them in an electric pressure cooker. There’s no watching and waiting for the water to boil, or standing by to get the timing just right. Eggs turn out better when pressure cooked, in a couple of ways. For one thing, they’re reliably easy to peel — something about the pressurized steam helps the eggs to unstick from the thin membrane between the egg and shell. Even super-fresh eggs can be peeled without divots or layers of the egg white peeling off with the shell. The eggs also tend to come out with the yolks much more centered, making for a nicer presentation when it comes to deviled eggs. Since the eggs stand upright in a rack as they cook, the yolks are able to stay suspended right in the middle of the whites. 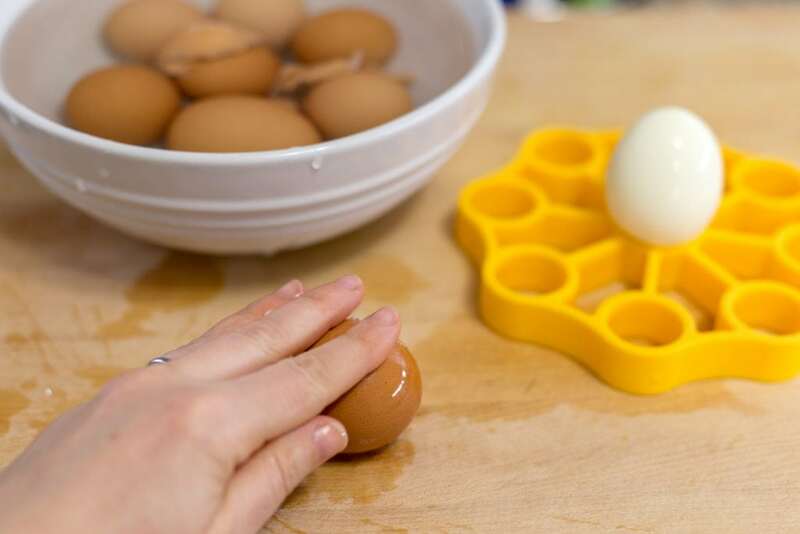 My favorite egg rack I’ve come across so far is the one from OXO. 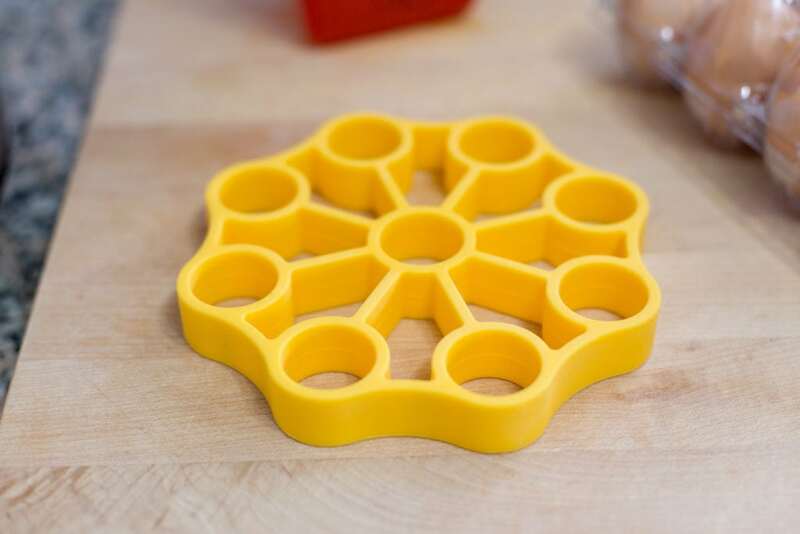 It’s a cheery yellow color, and I always love a bright and sunny kitchen accessory! It’s also incredibly well-designed and functional. Made of thick, sturdy silicone, it has a slightly grippy texture, allowing the eggs to rest firmly in their little circular spots. It holds up to 9 eggs, and of course you can steam fewer at a time if you like. 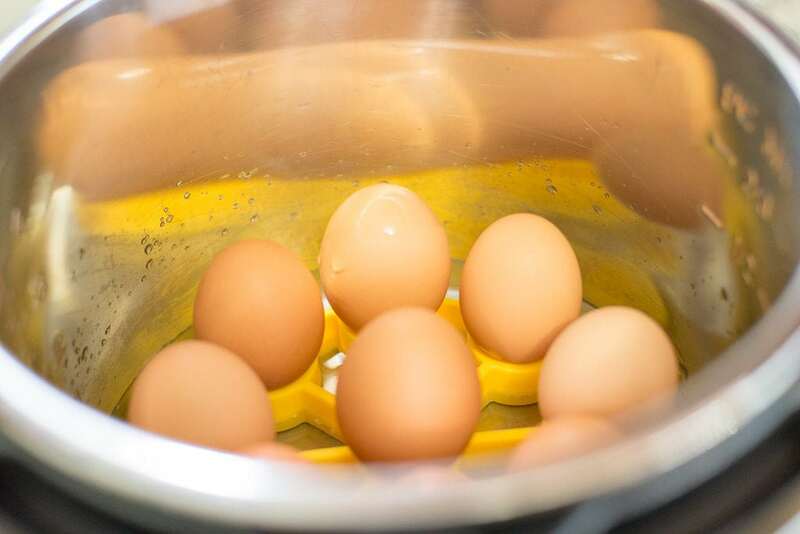 If you want to steam even more eggs, the racks are stackable — you can rest another one on top of a layer of eggs, so up to 18 will fit in the pot at once. 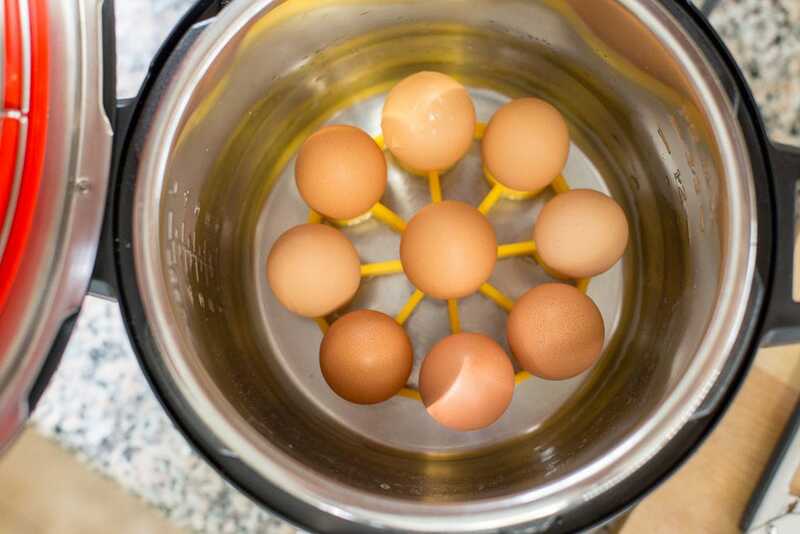 The egg rack is sized to fit in every size of Instant Pot, too, including the Mini (3-quart) size. 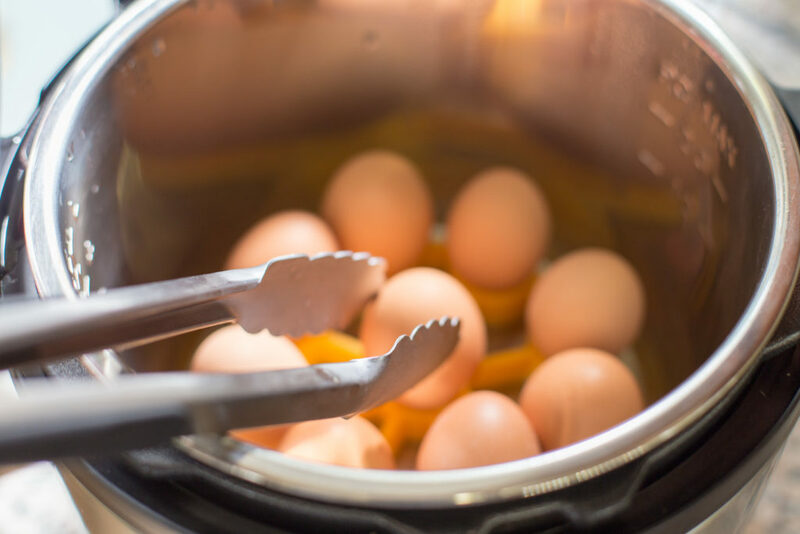 There are lots of different timing variations given for hard boiling eggs in the Instant Pot. My favorite is the easiest one to remember: 5 minutes of cooking, followed by 5 minutes of natural pressure release. This works for extra large eggs, and you can adjust the cooking time up or down by a minute if you’re using jumbo or large eggs, respectively. And now, onto the step-by-step how-to! 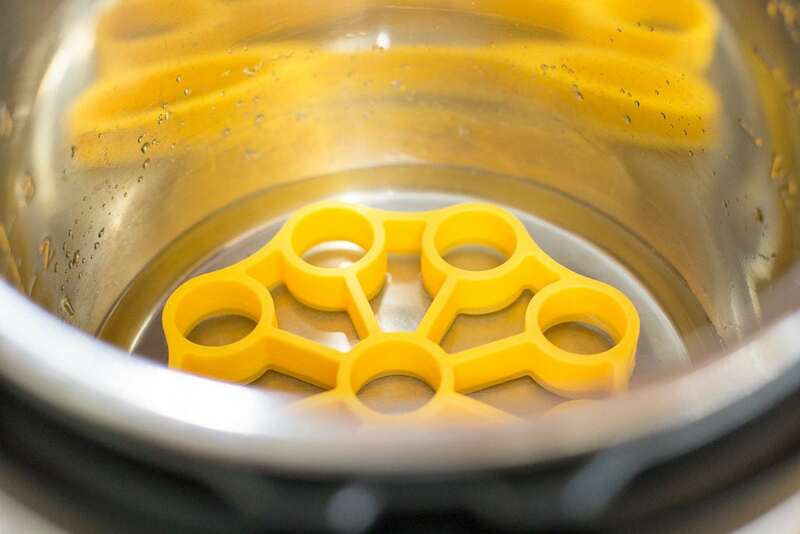 Pour a cup of water into the Instant Pot and place the OXO Silicone Pressure Cooker Egg Rack inside. Place the eggs on top of the rack. Secure the lid and make sure the pressure release is set to its Sealing position. 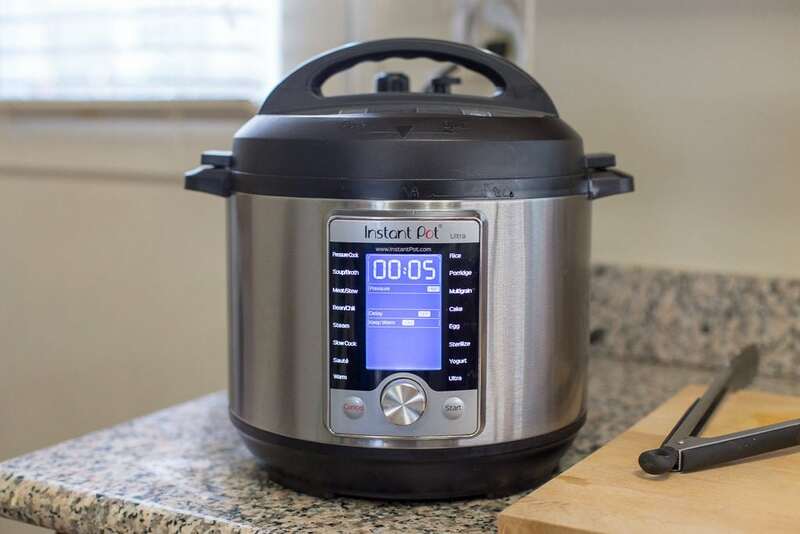 Select the Egg program for its default time/pressure setting, or if your Instant Pot doesn’t have an Egg program, select the Steam setting and set the cooking time for 5 minutes at high pressure. While the eggs are cooking, prepare an ice bath. 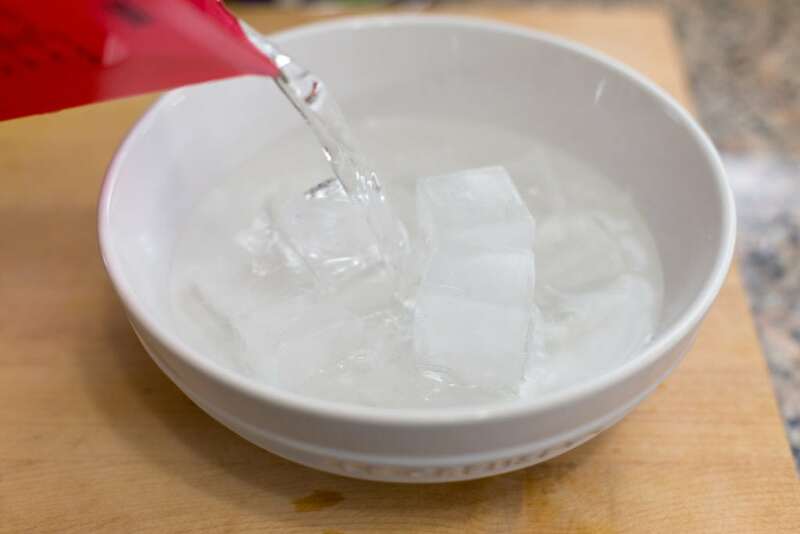 In a bowl, combine a trayful of ice cubes and 2 cups of water. 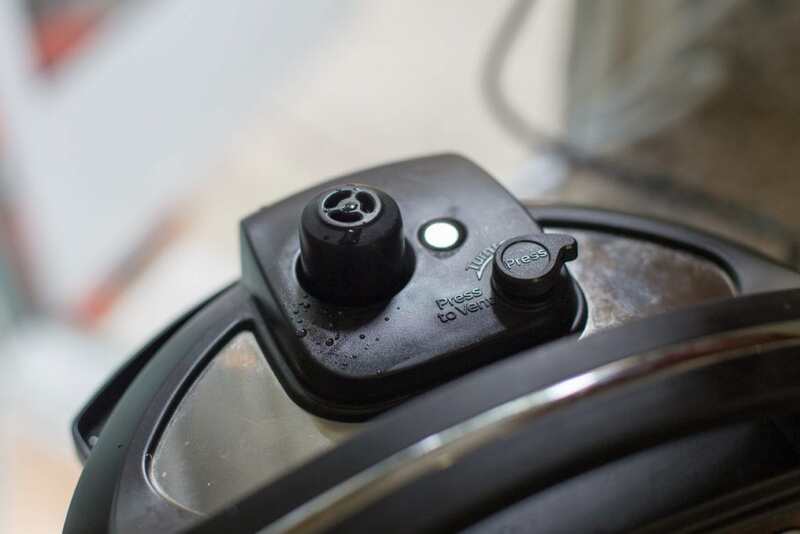 When the countdown ends and the cooking program is finished, let the pressure release naturally for another 5 minutes, then move the Pressure Release to its Venting position to release the remaining steam from the pot. Open the pot. 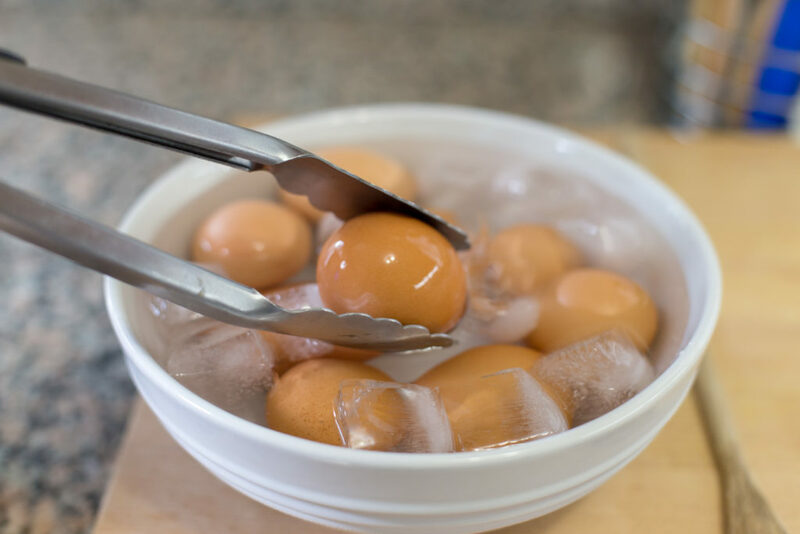 Using a pair of tongs, transfer the eggs from the pot into the ice bath. Leave the eggs in the ice bath for 10 minutes, until all of the ice is melted and the eggs are cool. You can store the eggs in their shells, or peel them right away. To peel, roll an egg around on a flat surface, pressing down with moderate pressure. You don’t want to smush the egg, but you do want to crack the shell all over, making it much easier to peel and loosening the shell’s membrane from the egg inside. Starting at the pointy end of the egg, carefully peel off the shell. Dunk the egg back into the ice bath water to remove any bits of shell that are still clinging on. And you’re done! 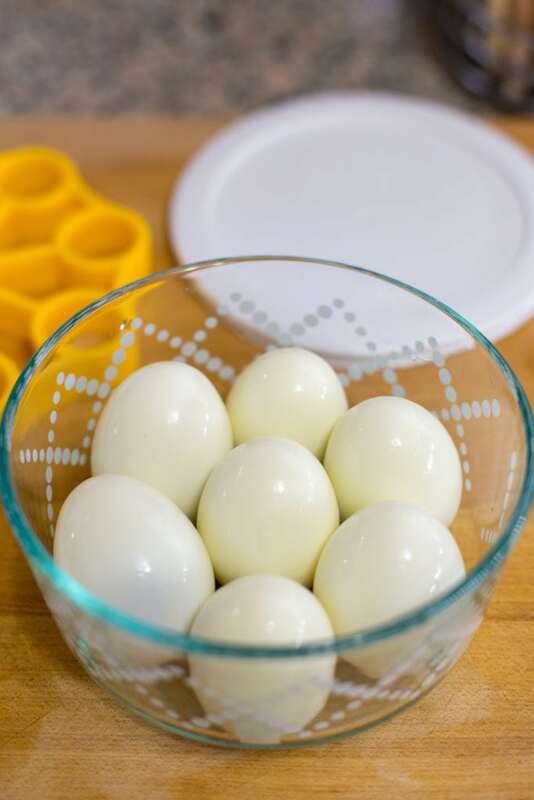 Eat or use the eggs right away, or store them in a tightly lidded container in the refrigerator. To keep the eggs fresh in the fridge for up to a week, cover them with cold water, and change out the water daily. Thanks so much for reading this post! 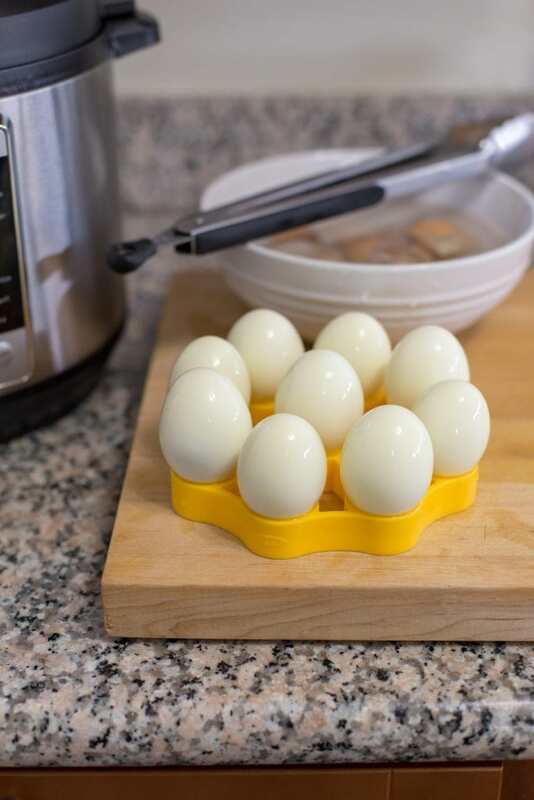 To enter to win an OXO Silicone Pressure Cooker Egg Rack, leave a comment telling me your favorite way to eat hard boiled eggs. I could use some new ideas for my favorite snack food! ???? Thanks for the post! I love Mine with a sriracha sipping sauce ! Egg salad with a little mayo, onion, celery, and capers! In my salads! Thanks for the chance to win, this is the best egg accessory I’ve seen so far too! cut in half with a little salt and pepper. I use them in salads. I like to put hard boiled eggs on salads (Salade Nicoise, Cobb Salad etc.). I eat them on toasted Davers Killer Bread with peanut spread and spinach then slice the HB egg and put it on top of the spinach! Season it with Cavanders Salt Free Greek Seasoning! Salt and pepper! Or I add to my chicken salad with a little mayo and celery! I love deviled eggs or slicing them on a salad, but mine rarely last long enough to get that far as they tend to disappear with a little salt and pepper right after being cooked! Haha! Egg Salad is my favorite way closely followed by cold with some salt. 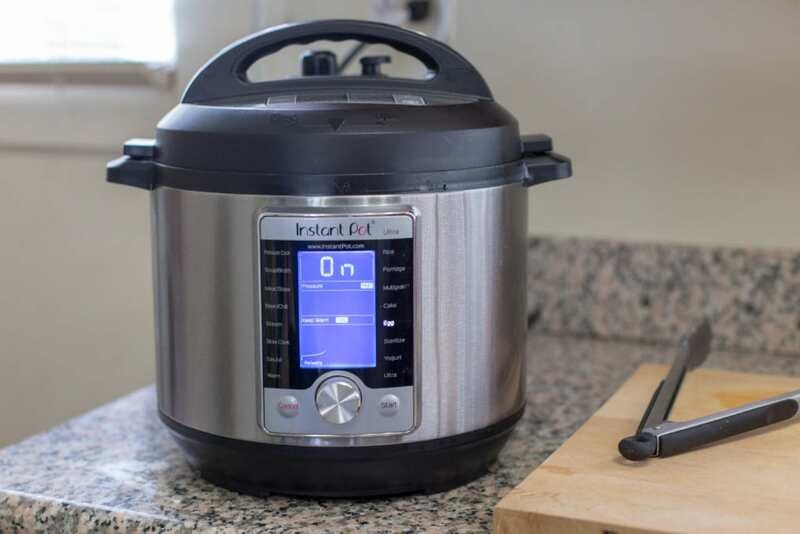 with salt and pepa…I like to push it….the buttons on my instant pot!!! A little salt and pepper, and smoked paprika. I love to make them into an eggsalad sandwich. Hard boiled eggs halved with butter and salt. I love eating hard boiled eggs with salt, pepper, and Frank’s hot sauce on them…or made into a yummy egg salad. I make an egg salad sandwich by mixing 3 hard boiled eggs with some mayonnaise. I enjoy them sliced with some Frank’s Hot sauce powder sprinkled on top. I love egg salad and deviled eggs!! We have an instant pot we purchased in December. My husband loves eggsalad sandwiches & my mother likes them on lettuce leafs. I never can figure if I’m cooking the eggs correctly & long enough. Winning this on my husbands birthday (may 29th. Mine b day was yesterday the 22st) would be do exciting! My favorite ways are deviled eggs or egg salad sandwiches. Have you tried a thin bagle with mashed avocado and hard boiled egg crumbled on it? So good! And adds protein! daily to balance his carb to protein ratios. I love them sliced on toast and sprinkled with a little curry powder and salt, or just halved and sprinkled with Mexican chili lime seasoning!. You can buy the seasoning in most Mexican grocery stores. Also, Trader Joe’s Everything But the Bagel seasoning is delicious on eggs! With a friend. I only eat the yolk so like to share with someone who likes the white. Met someone that way when I was thirteen. We are now sixty and still great friends! I’m a Southern girl, so it’s all about deviled eggs for me! We like our eggs deviled! Sliced, with celery salt sprinkled on top! I love them every way! Egg salad with avocado, celery, mayo, onion is one favorite. What a great giveaway! Thank you for the opportunity! I loves my eggs with a little salt and pepper. A snack, or for breakfast and deviled eggs. Thanks for the info. I’m simple, usually just straight up. But I do so love the soft boiled eggs in my ramen..
Mash 2 hard boiled eggs with half an avocado, season to taste. Green egg salad to serve on bread, crackers, chips, or lettuce cups. I usually eat one for breakfast, they’ll also appear in salads and sandwiches often. I like them plain with salt and pepper, deviled or in any salads. Two eggs chopped in a bowl with a little mayo, salt, pepper and paprika- lazy man’s deviled eggs! I’m just trying to find a way to ask you : what size instant pot are your recipes for in the Essential Instant Pot cookbook ?? Trying to figure how to double for my 10 quart cooker. Thank you. They’re meant for a 6-quart pressure cooker. I hope that helps with your conversions! Oh in potato salad ! My favorite! I just eat them plain with a little Real Salt (Redmond mineral) sprinkled on each bite. 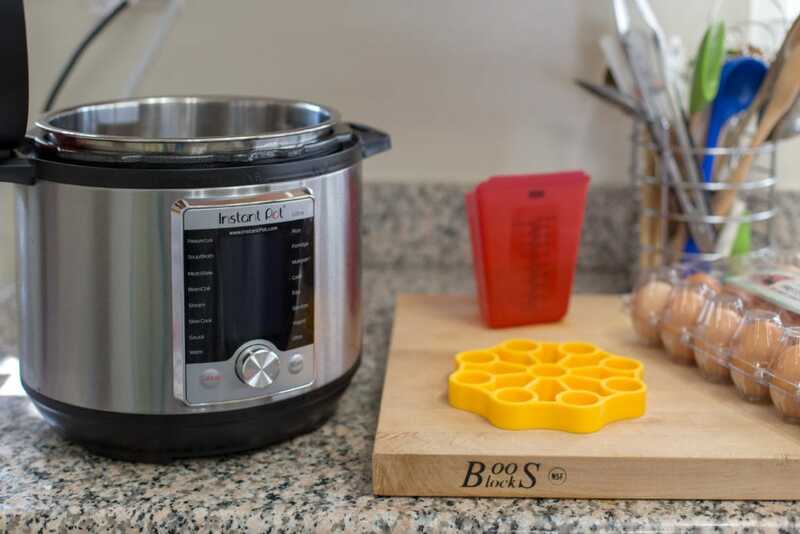 Newbie to instant pot and would love this! I like boiled eggs with a dab of mayo and salt and pepper….on each bite!